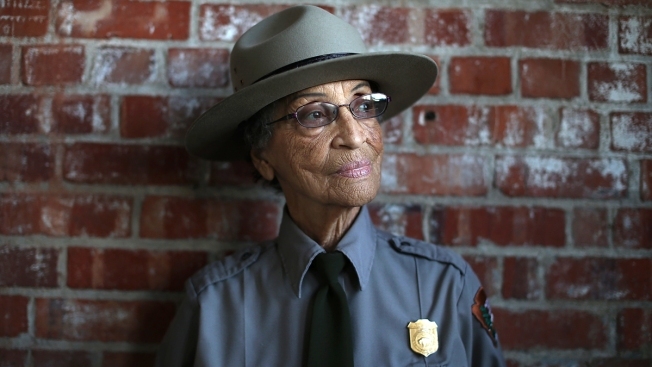 At least two groups are raising funds for Betty Reid Soskin, the nation’s oldest full-time park ranger, who was beaten and robbed while she slept at her Richmond, California apartment this week. The Rosie the Riveter Trust, the nonprofit that supports the 94-year-old’s place of work, has set up a special fund to replace the jewelry, cell phone and computers stolen from her apartment on Monday night, when police said an intruder snuck in and punched Soskin several times, waking her from her sleep. The thief also stole a coin given to her by President Obama, who honored her in December during the national Christmas tree lighting ceremony in Washington, D.C. The Secretary of the Interior has since told Soskin that the president would replace the coin. Soskin, who works at the Rosie the Riveter/WWII Home Front National Historical Park, prefers that people donate to this fund, according to her boss, Park Supt. Tom Leatherman. That’s because she would like to donate any extra money that comes in to a documentary being produced that will encompass some of Soskin’s life, when she worked as a clerk for the all-black Boilermakers A-36 during World War II. In addition, a separate fund was created by a community member, Nicholas Arzio of El Ceritto, who met Soskin at an award’s dinner, where the two became friendly. As of Friday, Arzio’s GoFundMe fundraiser has raised nearly $11,000, more than its original $10,000 goal. Leatherman said Arzio's fund is legitimate and was created before the formal Rosie trust donation site was founded.